Vipul and Harsheen talked about how they followed Sanjay Leela Bhansali's vision while creating armours for Padmaavat actors. Ranveer Singh and Shahid Kapoor's characters in Sanjay Leela Bhansali's Padmaavat has left everyone spellbound. After making Sushant Singh Rajput's warrior look in Raabta, Delhi-based design house, The V Renaissance, showcased their design proficiency once again in Bhansali's magnum opus. 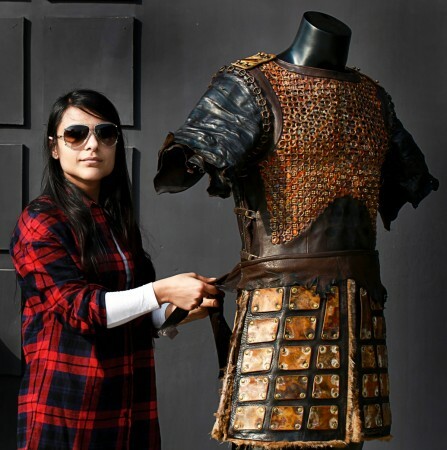 Designer duo Vipul Amar and psychologist Harsheen Arora combined their forces to create warrior costumes for Shahid Kapoor as Maharawal Ratan Singh and Ranveer Singh as Alauddin Khilji in the movie. In an exclusive interview with International Business Times India, Vipul and Harsheen talked about how they followed Bhansali's vision while creating armours for the actors. IBT: Did you have to dig into history to understand Alauddin Khilji and Maharawal Ratan Singh's armours? Vipul and Harsheen: The armours had to be designed by amalgamating Mr. Bhansali's vision of his characters, the personality of the actors playing the part, functionality, and history pertaining to that era. IBT: What was your inspiration for designing these armours? Vipul and Harsheen: We always get inspired by challenges, that allows us to create distinction. In this case, the work was to make an armour, for characters which were poles apart. This gave us endless possibilities to experiment with various permutations and combinations. We derived inspiration from the characters themselves and their personality as envisioned by Mr. Bhansali. IBT: What is the most important thing that you kept in mind while designing the armour? Of course to create such grand pieces a lot of detailing goes in every department, which we might have forgotten to mention in the above list. IBT: Whose armour has more intricate detailing -- Shahid Kapoor or Ranveer Singh? Vipul and Harsheen: All the three armours needed an immense amount of time and hard work to make it look as real as possible. However, the main armours of Shahid and Ranveer for the final battle are more elaborate with detailed intricacies. Also, they had to be one of a kind and unique in every aspect from each other, hence for us, making armours for both of them were equally challenging. Vipul and Harsheen: The main boost of working with Sanjay Leela Bhansali is the fact that you already know what life he will put into his visuals. IBT: What are your upcoming Bollywood projects? Vipul and Harsheen: There are two projects which are still in the development stage. Hopefully we will be able to share something with you soon.